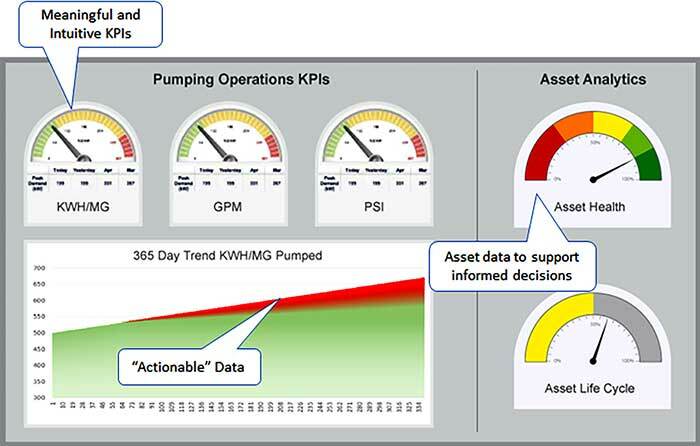 Tips for identifying pumps to be tested and evaluating KPIs. The term wire-to-water efficiency has been used in the pumping industry for years, but what does it really mean? Simply put, it is a way to determine how efficiently an electromechanical system uses electricity to perform work, such as pumping. In hydraulic terms, it is the ratio of water horsepower (hp) output to true horsepower, or kilowatt, input to the motor. Wire-to-water efficiency considers the efficiency of the pump, motor and variable frequency drive (VFD), if applicable, at a series of operating points that simulate historical conditions, so a baseline efficiency, or energy intensity in kilowatt-hour per million gallons (kWh/mg), can be established. The kWh/mg can then be compared to the other pumps in the system to determine which have the highest potential for energy savings and optimization. Not only do users want feedback about inefficient pumps, they also want to know what may be causing the inefficiency, even if it is a high-level overview of items that should be addressed. These suggestions are called energy efficiency measures (EEMs). See Image 1 for a depiction of inefficient pumping causes and symptoms and potential EEMs. First, identify which pumps to test. Users often ask, “How do I know which pumps to invest in for wire-to-water testing?” It is recommended that a high level energy intensity evaluation be performed prior to the field testing, so a shortlist can be ranked from highest kWh/mg to lowest. This evaluation involves taking the monthly consumed kWh (from the electric bill) and dividing by the total flow in million gallons pumped during the same billing cycle. If there is no flow metering at the pump station, a properly specified portable flow meter should be installed on the pump(s) so totalized flow data can be correlated to power consumption. Often the pump(s) being tested are served by the same billing meter as other electrical loads (for example, water and wastewater process equipment at treatment plants). In these situations, submetering is not typically available to trend the power consumption, so installing temporary power quality monitors (PQMs) on pump motor control centers (MCCs) is a good idea. Pumps that have a history of excessive maintenance, significant historical runtime, and/ or are greater than 40 hp tend to be good candidates for submetering with the PQMs so the kWh can be trended. Similar to a hydraulic modeling, wire-to-water efficiency testing follows the GIGO concept (garbage in equals garbage out). Extra effort should be spent ensuring the data used to build the evaluation is as accurate as possible. Remember, the main goal of wire-to-water testing is to determine how efficient your pump system is at using electricity in performing a mechanical task. This is done by dividing the water hp output by the electric hp input. This ratio will not only reveal the efficiency of the pump as a percentage, but also many other metrics can be derived from this test such as kilowatt per million gallons per day (kW/ mgd) and kWh/mg. Determining the wire-to-water efficiency establishes the baseline energy intensity so the increase in efficiency can be determined once the EEM is implemented. The result of the increase in efficiency for a specific flow and TDH recorded during the test is a reduction in horsepower. Sometimes EEMs—such as identifying a throttled valve, plugged suction strainer or air-locked pipe—result in flatter system curves that require less TDH to attain the same flow. 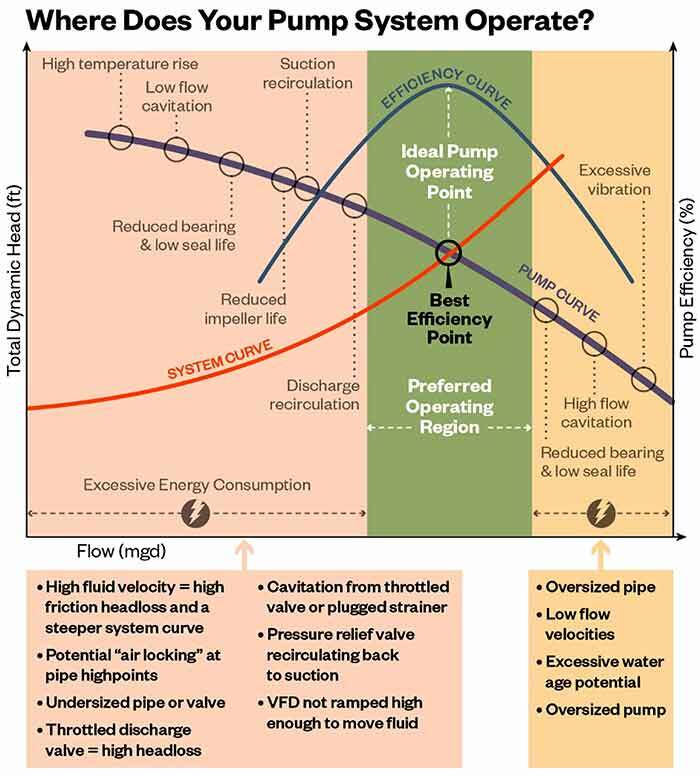 Selecting a new pump that intersects the flatter system curve at the best efficiency point (BEP) will result in additional power savings as shown in Image 1. Follow these wire-to-water testing tips for success.